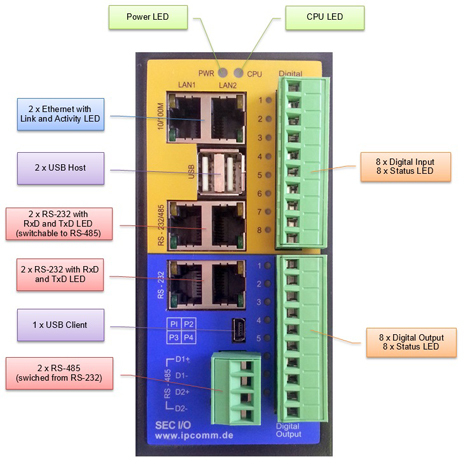 SECIO is a PC-based embedded controller especially designed for industrial applications. It contains no rotating parts. Thanks to its extremely low power demand no fan is needed. The versatile SECIO has a large variety of interfaces. Integrated LEDs offer a number of diagnostic functions. There are a send and receive indicator for the serial interfaces and high/low-LEDs for the digital inputs and outputs. A power indicator as well as a network controller indicator show the current operation state. A CPU LED shows the different software conditions. output current: 500 mA max.